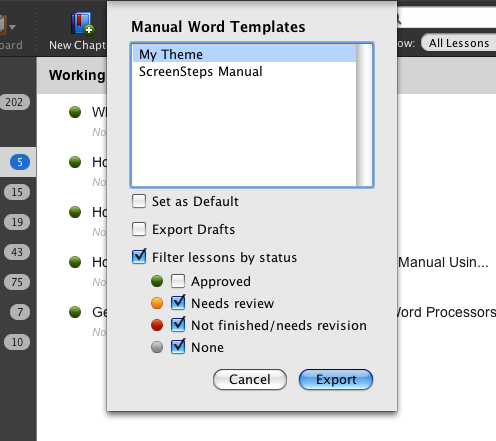 ScreenSteps Desktop 2.9 and Workgroup DocumentationScreenSteps Desktop & WorkgroupCreating Word Templates Working With Word TemplatesHow Do I Create A Manual Template? How Do I Create A Manual Template? 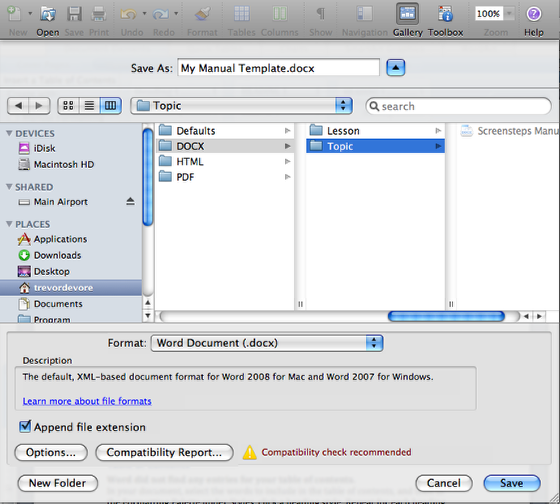 In order to create a template for use when exporting a manual to Word you will need a program that can save a DOCX file. 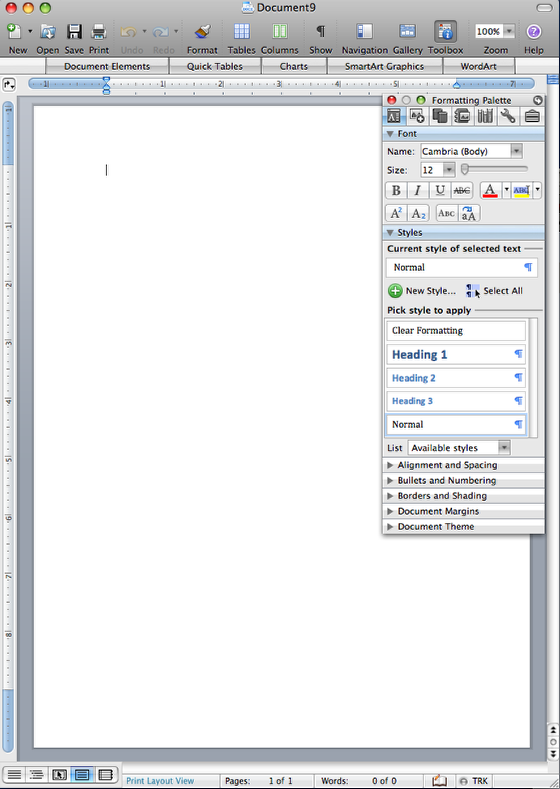 This lesson will show you how to use Microsoft Word (Word 2008 running on a Mac) to do this. Insert a page break between the manual title and the Table of Contents. Now insert a Table of Contents on page 2. 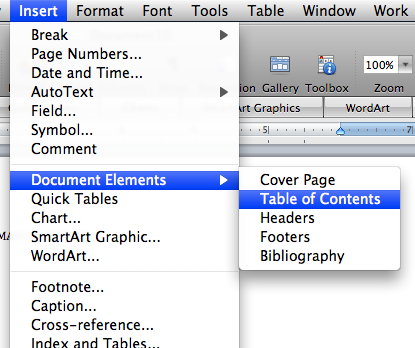 Use the Insert > Document Elements> Table of Contents menu. Now choose the style for your table of contents. Your Table of Contents will look something like this. 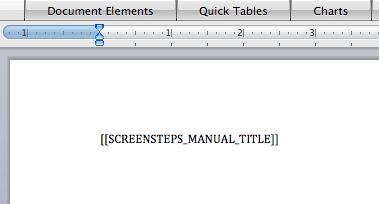 This is basically a placeholder where the Table of Contents will be inserted after you export a manual to DOCX. Note: You will need to open an exported file in a word processing application in order to have the Table of Contents generated. Insert a page break between the Table of Contents and the lessons. 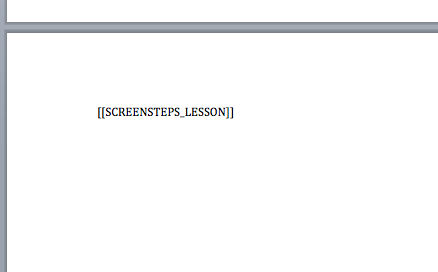 Now add the [[SCREENSTEPS_LESSON]] tag to the third page. When exporting a lesson ScreenSteps will look for this text in the document and replace it with the lesson contents. Follow the instructions relating to adding styles to your document in the lesson on creating a template for a lesson. You can now save the document in the ./DOCX/Topic folder in your Templates folder. 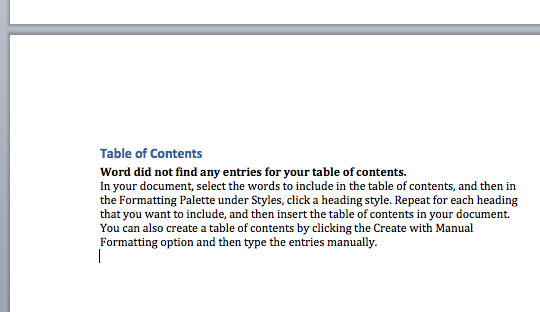 The next time you export a manual to Word your new template will be available. Prev: How Do I Create A Lesson Template? 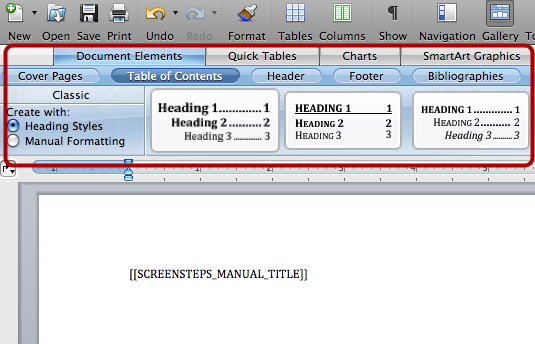 Next: How Do I Generate the Table of Contents For A Manual Using Microsoft Word? Should this be able to be performed with the Trial version of Pro? @Violet - Yes, custom Word templates will work with the trial version of Pro. Where Can I Find Word Templates? How Do I Create A Lesson Template? How Do I Generate the Table of Contents For A Manual Using Microsoft Word?